Conducted by Dr. Suzanne Pence, the Concert Chorale bears a tradition of maintaining the highest standards of musical excellence. Membership is comprised of both music and non-music majors and varies from 50-70 participants. This ensemble offers students an excellent opportunity to perform a broad range of choral literature at the highest performance level. Singing in one of UT’s choral ensembles has been one of the largest student participating activities on campus for many years. Thousands of UT students have shared the experiences of preparing and presenting concerts to audiences of all kinds and sizes, and from these experiences they take away valuable musical memories and friendships. We would like to share some of these experiences with you while you attend The University of Texas at Austin. 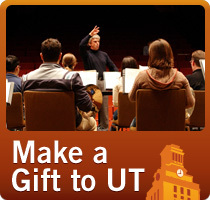 All UT choirs are open to any UT student, regardless of major or previous choral experience. Every student, new or returning, must audition for membership, either through an individual audition with choral music faculty, or through a recall audition. Schedule an audition online at www.wejoinin.com/UTchoirs. The 8-minute audition consists of vocalizations, pitch memory/recall, and sight-reading. Students are not required to have a prepared piece. A preliminary list of audition results will be posted on the bulletin boards on Tuesday evening. This list includes call-back audition details. A final list will be posted that Friday. If your name doesn’t appear on the Tuesday list be sure to check the Friday list after all auditions have been completed. Students may register for a choral ensemble at any time. However, some students who have registered prior to auditions may need to be placed in a different ensemble after auditioning. In this case, it is the student’s responsibility to make the appropriate changes during the ADD/DROP period as listed in the course schedule. Also, please note that when registering for Chamber Singers, Concert Chorale, or Choral Arts Society undergraduates must register under ENS 109 and graduate students must register under MUS 180K. Registration for all other choirs is under ENS 109 only. Spring auditions are only scheduled by the listed professor and are only if there is space in the ensemble.